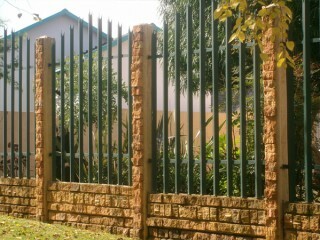 Country Wide walling install brick and steel inserts walling, which is face brick concerete walling with steel inserts. We can install a precast wall with steel devils fork inserts for you. By doing this we create a concrete wall that both looks aesthatically pleasing as well as affording you a view. In today’s age you want to be able to see what is going on behind the wall in specific areas. Here at Country Wide Walling we make sure our clients get what they want and need. We can supply them with whatever need they have. From the developers to the all- day home owner. We, at Country wide, have a lot of clients that have been supporting us with steel inserts where we make sure we do the precast walling for our clients, and add in the steel inserts to give our clients more quality and a stronger product to last longer than all of our competitors can offer. Country Wide Walling can supply one of the best quality walls, made up of facebrick and steel inserts to show our quality of work. Our facebrick and steel inserts is a product we have been specialising in for over 25 years of existence, and have a good name in our industry all over the country, with every client that has been dealing with us and making use of the good and friendly service of our staff. So please feel free to contact us regarding our steel inserts and any more products we can offer you, from gates, concrete palisade fencing, walling, concrete palisades, concrete steel inserts, etc. Country Wide Walling has been in existence for over twenty five years and is being run by the Williams family in the East Rand. We do work all over Gauteng . So contact us today and we will come and quote you on brick and steel inserts today. Should you require more information on precast walling or steel inserts, contact us.